Manufacturers are developing two packaging designs for the same product: those destined for the retail shelf, and those sent directly to consumers. Tide created a stir when it introduced e-commerce packaging for laundry detergent, shifting to a cardboard case holding a bladder of liquid detergent. Comparisons to boxed wine ensued, with its meta depictions of the original Tide bottle printed onto the box. Tide made this detergent with 30% less water, which means it’s lighter and more compact to ship. It also uses less packaging and plastic while still washing the same number of loads. "They took a flagship product and changed it," said Andrew Hurley, associate professor at Clemson University’s packaging sciences department and founder of Package InSight, a research and consulting company. "It’s laundry detergent. You’re buying packaging," he told Supply Chain Dive. Manufacturers like Tide are now developing two packaging designs for the same product: those destined for the retail shelf, and those sent directly to consumers. "On the store shelves, they need to make a large impact, using more filler (in detergent) to make it look like you’re getting more value," Austin Schulte, a packaging scientist with Package InSight, told Supply Chain Dive. But in e-commerce, dimensional size and weight matter. By increasing the concentration and shrinking the package size, it’s cheaper to ship. Excess and difficult packaging can affect what consumers think of the brand. Hurley said he ordered BIC lighters from Amazon, and they came in a customized box. After opening the box, he saw wadded up paper and then a retail blister package. The lighters were ready to be hung on a rack. It would have been more practical to put the lighters in the box with an insert, he said. BIC could have taken a lesson from 3M, which reduced its Command Strips packaging for e-commerce purchases. They use a polybag instead of the hard plastic strip packs seen at retail locations. They also removed the boxes that stores use to separate individual packs. 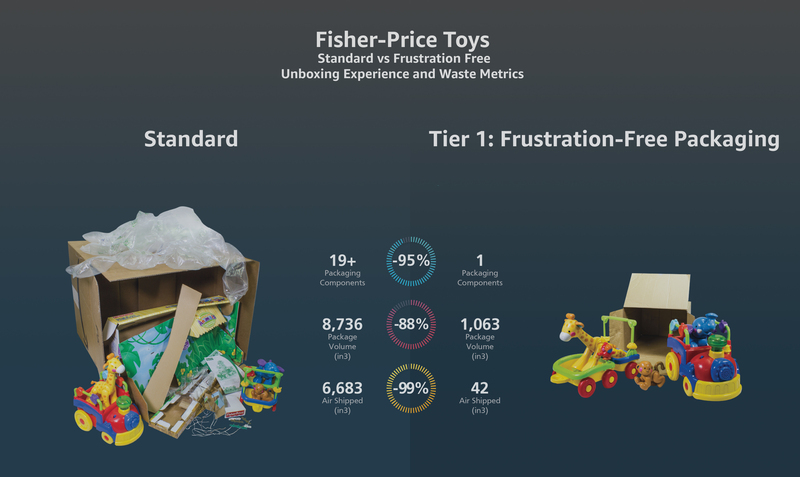 In recent years, Hasbro and Fisher-Price repackaged toys ordered online to simplify the unboxing process. "On the retail shelf, you need a bright shiny looking package, with cut-out windows so consumers can see and feel it," Sandeep Kulkarni, founder and president of sustainable packaging consulting company KoolEarth Solutions, told Supply Chain Dive. That’s irrelevant for those buying from a website. "A lot of store packaging has twist ties to keep things from being stolen. It made for a frustrating experience when someone buys a toy and it takes them half an hour to take it out of the packaging," he said. Some manufacturers that have not changed packaging for e-commerce are spending more to hire third-party repackers to separate packages for e-commerce sales, said Hurley. Overboxing has been common for shipping, Hurley said of the practice of packing the item in an outer box. "The smiling Amazon box will no longer be the standard." With Tide’s redesign, the new detergent box can be shipped as is. Like Tide boxes, reconfiguring packaging can make shipping simpler and use less material. Bags of dog food found in the grocery store aisles are difficult to ship to consumers, as they’re long, flat and flexible. They sit well on the retail shelf but are less efficient to deliver to consumers via truck. Putting that same bag in a box requires additional materials and has a high dimensional weight. Dog food company Hills Premium Dog Food is packed in smaller, branded boxes that nest more easily in the truck and can be stacked high. “They get a tremendous amount more dog food per truck, and it’s easier to carry,” said Hurley. The logo is on the box, providing a nice brand experience, he said, important as manufacturers are increasingly selling items direct to consumers, and bypassing the retailers. Amazon has had a frustration-free packaging program for more than a decade, aiming to decrease packaging materials and make it easier for consumers to open them and access the contents. Ten years into the program, the company said it helped eliminate 244,000 tons of packaging and 500 million boxes, Packaging World reported. Amazon’s new frustration-free certification guidelines go into effect Aug. 1, 2019. Early adopters will be rewarded with monetary incentives of $1 per newly-certified unit shipped by that date. After Aug. 1, retailers whose qualifying products are not certified in the program will be penalized with a $1.99 chargeback. "It’s guiding how everything is being done now," said Hurley. "The smiling Amazon box will no longer be the standard." The idea is to ship less air, use vendor-supplied packaging and no overboxes. "They can better cube out their trucks when shipping," said Schulte. Preferably the container would be 100% recyclable as well, without additional plastic and ties inside. With more packaging entering households, the recycling burden is increasing for consumers, "What used to be a concern for retailers, like Walmart or Kroger, disposing of all these boxes and packaging, is shifting more and more to the individual consumers," said Kulkarni. The biggest volume of packaging types is corrugated boxes, which are easily recycled, he said. While packing peanuts and the plastic air cushions are popular, companies like Dell have changed internal materials like molded fiber laptop inserts to materials like bamboo. "Companies are trying to simplify what goes inside the packaging, to ensure it gets recycled as well," Kulkarni said.